You may know that I try to post sometheng everyday - whether or not I have something worthwhile to say :). So if you missed me yesterday, it was because we were without power all day - seems as though that's typical for every significant weather event, part of living out in the country I guess. So with the impending storm and in trying to be prepared, on Friday, I filled four large pots with drinking water and two buckets and a large bathtub full for other uses - flushing the toilet for example. This is not my first rodeo and I'm glad I did this as it was nice to have water and by laying in a good supply of firewood for the fireplace, I was able to keep the house from freezing up - and since our cooktop is gas we were still able to make up a big pot of chili. I sure realize our little minor inconvenience is nothing beside what many are experiencing. With the prediction of major snow - I had to send the following email to my son who has small kids - "Hey Guys - In looking at the weather forecast, it looks like you may get 6-12 inches of snow Fri & Sat. I know you'll be getting lots of advice from co-workers and the TV and growing up in Illinois, Ann is snow competent, but having grown up in snow country, I believe it's important I give you one critical piece of advice - be sure the kids sleds are slicked up and ready to go. Love Dad"
And now for what I'd planned to post before the weather issues. Eating out twice within a week, or even a month, is almost unheard of for me, but it just happened. Alex had to go to the orthodontist in Knoxville on Wednesday and I agreed to go along in an effort to get out and about more. We went to Sam’s and I bought a little meat to smoke then we went out for a mid afternoon dinner. 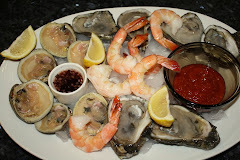 The one place I know of in the area that serves what seems to be real Cajun food is Bayou Bay in South Knoxville – I’ve never been to Louisiana to enjoy Cajun/Creole cooking. According to the waitress, the owner is from Louisiana and this is the same food he would serve there plus it was a favorite haunt of Louisiana boy, Peyton Manning, when he was playing football at UT. They have a wide selection of fried and broiled dishes, but I decided to go for a classic – crawfish etouffee, while Bev had fried oyster and fried shrimp appetizers. I’m far from an expert, but I think this was pretty good stuff, at least I enjoyed it, and it was way better than the dish I’d made at home using etouffee from a jar. Next time it will be jambalaya for me. Here’s a shot of my dish – I forgot until after I’d eaten several bites. Since the restaurant is about 40 miles from home, I’d probably not make a special trip for Cajun food, but I look forward to the next time we’re nearby. Alex, fresh from the orthodontist and in pain, ordered sauteed grouper and it came smothered in mushrooms. She couldn't eat anything so we took her's home and she ate the fish after taking some Tylenol, but the mushrooms remainded. I didn't take a pic, but they made a fantastic scrambled egg dish Thursday for breakfast. Bev didn't try them - she wasn't into fishy mushrooms. Whoops, maybe it's not spring afterall, the daffodills in the title picture are peaking out through an inch or so of snow this morning, and it's 20*. Enjoy the rest of your weekend and stay warm. I’m not a real cook like many of the food bloggers, but one thing I feel pretty good about is my scrambled eggs. As a kid, grandma taught me to add a little cream, cook them slowly, and gently fold them into large soft and moist curds and I’ve been cooking them that way for 50 years. 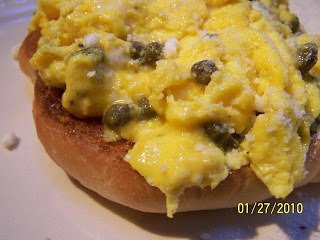 I’d been thinking scrambled eggs for breakfast and as I sat here reading through my blog favorites, what shows up on Lea Ann’s post over at Mangos, Chili and Z for that day but a new recipe for them. I checked the frig and found capers, snipped a sprig of rosemary when I returned form taking Alex to school and I was ready to go. We enjoy capers and are always looking for places to use them – even Alex likes them. She’s a little like my son – he wouldn’t eat the common roast beef and green beans, but would eat the more unusual country ham and raw broccoli. I basically made my normal eggs for Bev and I with the addition of a double recipe worth of rosemary, capers and cheese and served them on the last of the homemade burger buns – toasted. The one compromise was using pre-grated cheese - all I had on hand. Sided them with some tangerine wedges. 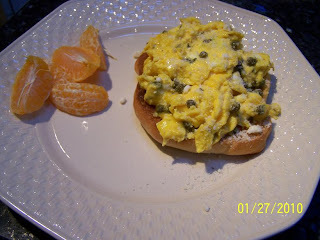 I’ve been adding different things to scrambled eggs my entire life and like Lea Ann, would never have come up with this, but Bev and I both thought they were very good – but you have to like capers. Next time, I think I’ll add some black olives to the mix. Thanks George and Lea Ann. We actually ate the meal on Wed but I had a backlog of things to post. About the title picture. Like much of the country, the first two weeks of January were unusually cold, and has been followed by a week or so of warm, moist weather. I was out getting a load of fireplace wood from my wood rack and noticed some green poking through the ground. Upon further inspection, the green was the first daffodil’s peeking out from under the leaves. They looked like they’ve been bit by the cold, and may yet again, but they are getting ready to begin beautifying the woods area and announcing that spring is here. Be sure to tune in tomorrow for a non breakfast post - about time you say?. This post has been in the queue for a few days and covers two meals, but I think it still ok.
Bev got up, said she didn’t feel well, and went back to bed, so I knew I was on my own for breakfast today. I thought about it for a while and decided the number one criteria for the meal was utilizing one of her homemade burger buns and my first thought was a scrambled egg and sausage sandwich – but I was sure we had no sausage. So I went refrigerator diving and discovered a nice slice of ham left from a meal the other day, so it became a ham and fried egg sandwich with Cabot sharp cheddar and mayo. I tossed the ham in the skillet to warm up and in the same skillet I fried two eggs (they were small and it’s a big bun)– I broke the yokes so they would harden. Here they are before and after flipping. 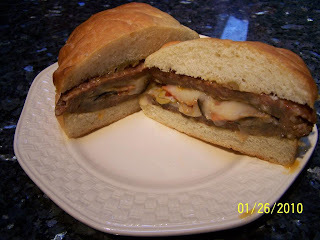 The finished sandwich – have I said I like the meat to overhang the bread? It was very good, but the addition of a little chopped onion would have made it outstanding – assuming of course you like onion. I’m not sure granddaughter Alex would have admitted it, but this was definitely better than McDonalds. Since it was the normal bread recipe, I knew the bun would taste good, but I liked that it held together much better than store bought – maybe Bev will make this a regular feature on bread day. I followed it up with a glass of homemade mater juice – best thing in the world to wash down big pills. You may know this, but I love breakfast food. It's now a day later and I just decided to tack this on to the above. Bev feels better, but had to leave early to be with her mom who's in the hospital having some tests run. As a result, I'm alone for breakfast again and again thought in terms of scrambled eggs with some leftover port loin chopped up in them on another bun. When I dug in the frig to find the meat to what did my wondering eyes did appear but a bun sized piece of leftover smoked pizza fatty. I'd struck the mother lode and quickly stuck it in the mirco for a quick warm up. It was probably a little past it's expiration date, but I couldn't pass it up. Here's the result and boy was it good. The title photo is Kitty, the resident mouser. She just came by for me to provide her morning head scratching. I just scratch and she moves her head around to the right place. Have a great day and I enjoy your comments and suggestions. I’ve posted several times that the kid in me likes the occasional nice 6” snow but I’m sure glad it’s been warm for the past week. According to my rain gauge, we’ve had 4 ½ inches, which could have been about 4 feet of snow. Since a 6” snow shuts everything down around here, you can imagine what snowfall measured in feet does. 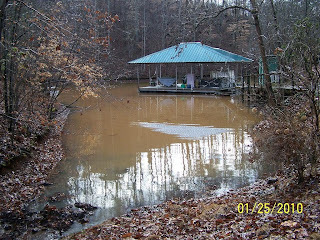 Remember earlier this month, I posted this picture of my lake cove frozen over – it was also at winter pool, which is six feet below summer pool. Here’s the same shot taken late morning on Jan 25 and the water has risen about four feet and came up another foot after I took this shot. I'm glad we live on top of a little hill and don't have to worry about flooding, unless we see an ark floating by. I believe all of the regions drought starved lakes of a couple of years ago should be more than full by now. How do you like the appealing color of the water - it may be even browner than the photo shows. Before the days of flood control dams that slowed down the river flow, some of this silt may have eventually contributed to the continued area growth of Lousiana. I can only imagine what the flooding would have been like had the lakes not been there to store all this water. The title photo is Kitty (clever name huh?) the resident mouser. While commenting on a blog yesterday, I had to toss my compter aside and race to rescue a Tufted Titmouse she had brought in - pet doors allow her outside access. I'm sure it's quite a show to watch, since I can't catch the loose bird, but have to let Kitty catch it then get it from here before too much damage is done. In this case, the plan worked great and the bird flew off as soon as I opened my hands. It's hard to believe such a docile looking creature could be such an effective killer. Beverly is the baker in the family – it scares me to think of even trying – and she bakes bread about once a week using a sourdough starter given to her by a friend. After just having burgers for dinner and seeing others do it on a couple of blogs, I suggested she make one loaf of bread into six burger buns. She did it by cutting the dough into six pieces, making a ball and hand shaping. I’d looked up a couple of recipes that suggested rolling out the dough and cutting them like biscuits. I thought for first try hers turned out great. They did not have the consistent round shape cutting them out would have achieved and they were a little crustier than store bought, but I consider both of these signs they were homemade. Here’s a shot of Alex’s meal of burger and sautéed shrooms. Bev pretty much just bakes loaf bread and occasionally rolls for special meals. After the bun success, I think I have her convinced to expand her horizons with round loafs, crusty Italian, French baguettes, etc. And the best part is I’ll have to test them all out. I also hope for the next bread day, we can make some pepperoni rolls, pistolettes ala Chez and rolls for baking eggs in. 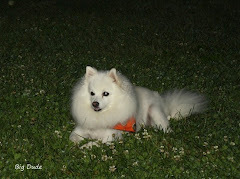 The title photo is Sweetie, the alpha dog in the family. I know I’ve mentioned this, but the town where I grew up in Northern WV has a large Italian population. When my parents visited with their friends, my sister and I always were taken along and many of their friends were Italian. Frequently the grandmother lived with them and spoke only broken English, so needless to say, when it comes to Italian food, I was exposed to the real stuff, especially around the holidays. I say all of this to say that after growing up on the real stuff, I’m picky (more like I’m a snob) about going to an Italian restaurant – I don’t do Olive Garden or any other chain – have tried several though. So we were talking with a friend the other day and the conversation got around to Italian restaurants and I said the closest to the real thing I’ve had in this area was at Naples in Knoxville, although I hadn’t eaten there in at least 15 years – but it’s still the family owned place it has been since 1955 – three different families, but the current owner has had it since 1981. We don’t eat out often, but when we do, rather than pick a restaurant then decide what cuisine to eat, I pick the cuisine I want to eat, then go to the place that does it best. So I don’t go to a seafood restaurant and order steak or spaghetti. I’m somewhat of a purist and for me it’s all about the sauce (similar to the hot dog I posted about on Jan 19) and I prefer fresh tossed dishes to baked ones, although I love them too. The salad dressing and bread are also an important part of the meal. I had done a little website research on Naples, in the afternoon, to read up on their history. While there, I checked out the menu and knew what I was going to order when I walked in the door – unless they had a special that trumped my choice. After ordering they brought us a small flattened loaf of warm bread – looked like a large square hamburger bun, with herb butter. I really liked the butter and the bread was good, but clearly not the crusty Italian version I grew up with. My salad was a garden salad with house Italian dressing (creamy Italian) and it was large with lots of crispy vegetables and while the dressing was good, it was pretty mild (not real tangy). The entrée I selected was Pasta Supremo – “Pepperoni, sausage, meatballs, green pepper, onion and pimentos sautéed in a hearty tomato sauce and served over today's fresh pasta.” I was expecting a pretty big bed of spaghetti, topped with a few pieces of vegetables and meat and topped with tomato sauce. What I got was a small bed of wide egg noodles (I guess the pasta of the day) with lots of meat and vegetables in the sauce on top – just like the menu description. I thoroughly enjoyed it, thought the sauce, meatballs, and sausage were all very good and a wide noodle, which I like, is still pasta (looking closly at the pic, it appears the pasta has herbs or something made into it). In summary, I still think it’s the closest to the real thing I’ve had in this area even though the bread and salad were more for the East Tennessee taste – I guess they want to stay in business. I will definitely go back and not wait 15 more years to do it. The one chain I’ve not tried, and many folks rave about, is Carrabba’s which will be my next Italian restaurant meal. 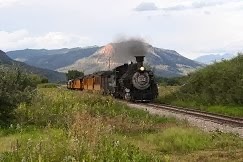 I suggested several things for Fridays supper, but Bev turned them all down, including grilled steak and scallops, and opted for a hamburger – her favorite beef dish. I remembered wanting to try a green chile cheese burger after seeing Bobby Flay make one recently, and we just happen to have some home grown peppers in the freezer. I looked around the net and most recipes utilized a sauce made from the peppers, but I didn’t want that. I finally found one that added chili powder and cumin to the meat and then just added grilled peppers and onions on the burger, which was more what I had in mind. For a pound of hamburger, I mixed in a teaspoon each of salt and Billy Bones Bucksnort Chili Powder, and a half teaspoon each of cumin and black pepper. In case you think I just can’t spell, for me, chili is a soup concoction and chile is the fruit from a particular genus of peppers. Since we had pretty big buns, I made up 6 oz patties – I like the meat to be bigger than the bun so that the first thing my tongue meets is the meat. Here they are ready for the grill – note the anti-swell-up-dimple in middle of them. I could have gone to 7 oz, but I don’t like them to be so thick I can’t get my mouth around them, so I’d fail at TV quality burgers – which always look to be an inch thick. I grilled them until the juice just came to the top, flipped them and when it did it again, I added a slice of smoked provolone and cooked another minute and took them off. While they were cooking, I also grilled the onion and warmed the green chiles. Here’s everything cooking. Here’s the assembled sandwich ready to become good eats. I might try them with the chile pepper sauce sometime, but these would be hard to beat. The spices were evident in the meat, I could taste the peppers, and I really liked the combination of flavors. The two things I’ll do different next time is mix the spices in the meat the day before to let the flavors distribute in the meat and put the onion on the sooner – it was a potent little fella – typical wintertime onion. One is a golden oldie and the other is brand new to us. Since I retired 10 years ago, I eat an egg or two most mornings – I know, some say they’re bad for me, but I just love eggs and in case you're a new reader - I love breakfast food. For all the eggs I’ve eaten, I’ve never had them baked and had been wanting to do so since seeing Ina Garten fix them on the Food Network. I used her recipe, except I wanted them that morning, but didn’t have fresh herbs, so after putting them in the little prep bowls, I sprinkled with a little dried thyme, parsley, chives, and garlic powder (I was just too lazy to mince fresh garlic) in hopes they would re-hydrate some while the ramekins heated up. After adding the eggs to the heated ramekins, I sprinkled on the parmesan cheese and back under the broiler they went. Rather than use the big oven for this small job, I just used the toaster oven and both the pre-heating and cooking took about 50% longer than Ina’s recipe calls for. I didn’t take a picture as it would not have been too impressive, however, we are both now big fans of herb baked eggs and look forward to trying with different herb blends. One of the real pluses is how quick and simple they are to prepare. Somewhere I have a recipe for the second meal called hunters breakfast, but I have no idea where to find it. As best I could remember, it is a scramble of potatoes, onions, ham, and eggs, but I like to include peppers as well. I used 5 small red potatoes, a medium Spanish onion, sweet peppers from the freezer, diced center cut ham, 7 eggs whipped with a little half and half, salt and pepper – I wanted enough leftover so I could have the same meal tomorrow without cooking. While writing this, I told Bev I should have put some garlic and herbage in it - I'll try adding some to the leftovers prior to reheating tomorrow. I started by cooking the potatoes in olive oil, then added the onions and peppers, then the ham and finally, when the other ingredients were done, the eggs. Here it is cooking before and after the egg addition. Here's my plate after I Chez-ized it by adding shredded cheddar - he does this alot but I use Cabot cheddar rather than his usual Tillamook. I opted for no sides, such as toast, so I could get my fill of this dish. The title photo is my first attempt at Bacon Explosion (bacon wrapped stuffed fatty) from last March, except mine is stuffed with hash browns, scrambled eggs, onions, and peppers - another Lipitor meal. During school, Alex generally prefers to eat cold cereal for breakfast. This last weekend, she got some sweet treat special meals. Friday, she had asked for pancakes for supper, but the stuff for another meal was already prepped, so I promised her some for breakfast on Saturday. After staying up a little late, she didn’t get up until afternoon, so it was a pancake for lunch and since the recipe makes more than one, I decided to join her – I had to eat something you know. Knowing we had some strawberries, she requested them in her pancake and knowing we had some blueberries, I opted for them in mine. Also, with a strawberry farm just up the road, I’m spoiled by the juicy, flavorful, picked-ripe-by-us (usually Bev) berries I have access too for about 3 months a year and I just refuse to eat the big, beautiful, picked green, tasteless ones shipped in from who knows where the rest of the year. I can’t recall ever making a pancake with strawberries, but it knew it would work great so a few of them were diced up and off we went - this is her's before flipping. And here's mine before flipping. When I moved it over to the kitchen island for syrup, I discovered a bag of pecans and decided since I already had fruit in it, some nuts would make it even healthier (LOL). I wish I’d seen them early enough to put inside, but sprinkled on top worked very well. The picture at the top is my plate and here's a close up. Most of the foodie sites I visit contain pretty special meals, but me, I just post whatever we eat and in this case, it was Aunt Jemima pancakes - just had to fess up :). However I do ocassionally make some gourmet quality pancakes from a great recipe, but no since wasting them on a kid who's going to pay more attention to Sponge Bob on the tube than to the pancakes she's eating. When I was growing up in Northern West Virginia, I was lucky to have a stay at home mom, as most of us did back then. She would be in the kitchen on those cold winter mornings, with all of the burners on the gas stove running full blast to help warm up the kitchen – it was a drafty old house with single pane windows and poor insulation. We had many regular breakfast meals, some of which I now refuse to eat, but only one really special one – Mom’s Puffy French toast. I’ll provide the recipe, but it takes a little practice to get the batter just right – my sister made it often and could do it, but we don’t, so ours is more hit or miss. I’m not sure if Mom came up with the recipe, it was an old family one, or it came from a cook book, but I’ve always loved it, even though I now realize, it’s just batter fried bread with syrup on it. She always used plain white bread, always cut it on a bias and cooked it two pieces (one bread slice) at a time using vegetable oil in an 8” cast iron skillet. So, I would get two pieces, then my sister, then me and so forth – usually 4 pieces was plenty, until I became a teenager. Here’s the recipe and the only trick is getting the consistency just right – it should be thick enough that only a little runs off when taken out of the batter. Water as needed to achieve thickness – I didn’t use any this time. After 8 months of living here, I decided it was time for Alex to experience the meal – boy have I been remiss, it’s actually been several years since we’ve had it even though it’s easy and I love it – what have I been thinking. So this is as close as I could get to how Mom did it, except we had to settle for some homemade bread. Here's the bread in the batter. The pieces frying in the pan - care must be taken to get the oil hot enough to have th batter puff up and brown, but not so hot as to get dark brown too quick. As a kid, it was just two pieces on a plate with syrup on top. But since the pecans were still around, I decided to add a few of them and a little powdered sugar for pretty. Have a great day and I enjoy your comments and improvement suggestions. 1 smoked sausage (frequently little smokies are used, but most meat works, I used pulled pork in these). 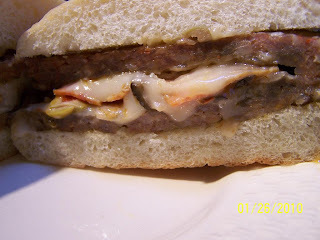 - Mix cheese, garlic, rub, mustard, mayo and BBQ sauce together and incorporate well. They are generally smoked along with whatever else you happen to be cooking, but must not get to hot or the stuffing will run out. The spicy heat in them is a function of the pepper and how good they are cleaned out inside. To cook them in a smoker, just put them on the rack, but I found in my grill and in the time I had to cook them, I needed the two outside burners on full blast and the three inside ones on low. Having bacon over direct heat would have been a giant fire, so I put them on a rack in a jellyroll pan over the inside burners and it worked great. Remember, a smoker is just an oven and a grill can be one too. A close up. For the sandwich, we just re-heated the meat a little and I used (for the first time) some Gates Extra Spicy sauce, which was given to us by our friends. It was real good, but the heat in the ABT’s made it seem pretty mild. I sided mine up with another batch of Bev’s slaw – she keeps getting better at it and the store bought cabbage is surprisingly sweet. Like her hot dog, Bev added the slaw to the meat and like my hot dog, I did not – danged if I’m going to ruin a good hot dog or BBQ by putting cabbage on it, but that’s just me. Here’s a pick of my plate. I think calling her finicky in a previous post may not be accurate – weird is probably closer – she’d usually rather have something out of a can or from a fast food joint than the pretty good stuff we cook around here. Oh well, at least she seems healthy and stays thin, so it's obviously working for her - she is rightfully in the eat-to-live category (verses live-to-eat). Several blogs I read have a picture that is changed regularly in the title box and I like that. Since my semi tecno-geek daughter was here for dinner I asked how how to do it and she said just go to ..., which I did and there it was - add image. So simple even I could do it, sometimes I'm such a dufus. I won't change it daily, but like being able to. Have a great day and I enjoy your comments. Definition of a picky eater: someone who will eat a greater variety of food than Alex. In an effort to get our live-in granddaughter, Alex, more involved with our meals and the family decisions, we decided to allow her to select the menu for one dinner a week, figuring it would be a bowl of cereal or chicken noodle soup from a can (it has been banned as part of this exercise). She will on occasion be willing to try something new and I think it surprises her and us when she says she likes it. The next step will be to she if we can inspire her to want to help cook her meal. For her first meal, she selected fish (crappie from the freezer) with lemon, butter, caper sauce which she’d tried here recently link, deep fried asparagus which she’d had while her parents were visiting over Christmas, and portabella mushrooms like the ones Bev stuffed the other day, but without the stuffing – hum. I was more than a little suprised by her meat and 2 veggie menu. Discovering she likes asparagus is new info and I told her to be prepared to be in hog heaven this spring, as my asparagus patch produces more than we can eat and it tastes light years better than store bought. We have a basic beer batter (flour, egg, beer, salt) that we use for most things, but I decided to surf the net a little and found this one to use on the asparagus. For the portabellas, we just sprinkled with a little garlic salt and sautéed in olive oil. The originals were coated with olive oil, sprinkled with garlic salt, stuffed and baked, so it was pretty close and we all liked them. Here’s a picture of Alex’s plate. I also battered and deep fried three cremini mushrooms and two pieces of fish to see how we liked them with the new batter - I believe it may be our new favorite. It has more flavors added and it’s lighter than our normal – kind of between it and a tempura. Here’s my plate with the experiments. It made for a good meal and I’m looking forward to next week’s menu choices. As an aside, we are far from wine connoisseurs, and most of what we drink is from a box (we’d go bankrupt if it were all $15/ bottle – but that’s another issue), but one of the ways we treat ourselves is belonging to the V. Sattui Wine Club, where we get two bottles per month of their choice of wine. We discovered the winery many years ago, before they were rich and famous, during a trip through Napa Valley and have always thought they make great red wines, especially cabernet. It’s not available in liquor stores here, and perhaps anywhere, so we have to visit the winery or mail order it. I’ve added this to today’s post as this month’s selection just arrived via Fedex. We'll look forward to trying it shortly. Have a great day and I enjoy your comments and suggestions. Monday was a beautiful day in East Tennessee at Almost Heaven South, with cobalt blue skies and temps in the 50’s. Bev, her sis, and Alex headed off to Pigeon Forge about 10am for a big day of shopping and left me in charge of the pets and dinner. We had already agreed on grilled hot dogs and Bev got a container of the requisite sauce out of the freezer. You may remember that where I came from we put sauce and not chili on our dogs. Chili is something else altogether - has beans and lot’s of tomatoes in it and is eaten from a bowl with a spoon, whereas the sauce it finally ground hamburger cooked in water with spices and maybe a little tomato and no beans (heaven forbid). I know both chili and dogs are very regional and up for lots of debate and I may be just describing a few counties in northern WV - so let's get on to the main topic. Peel and cut Russet potatoes into fries. Soak in cold water to remove some starch – they did it for a day, but I only had 3 hours for this. Blanch in oil (I use 325*) until they are cooked through and limber but not brown or crispy (mine were big so I did 7 minutes), remove, drain and cool. You can save some and finish cook next day if you like. Recook at a higher temp oil (I use 375 *) until brown and crispy (3-5 minutes). About 5 pm, I blanched them on the gas grill side burner (keeping down the stovetop mess again), put them on a wire rack and let them cool about an hour. This is the pan of raw fries that have been draining about 30 minutes. I used a batch size of our large wire basket dipper. This is one batch out and the next one ready to go. Sorry about the blur - I had the fry in one hand and camera in the other - but this is the way the blanched ones sholud behave. This is my set up, Chris, and I'm using the grill for a table today. I could put in a table, but I'd have to give up the corner chairs where Bev likes to sit with me and sip wine when I'm grilling, it's just Sweetie today. This is the batch of blanched taters - the brown stuff on them is the crispings left over from the fish fry, because I forgot to strain the oil - I didn't charge anyone extra for these. Then I fired up the grill (not worth using the charcoal Weber for a few dogs) and grilled the dogs, and at the same time, final cooked the fries on the side burner. Available hot dog toppings were tomato, onion and mayo for the mother-in-law (not sure how she came up with that for a dog) and onion, dill pickles, shredded cheddar, sauce and mustard for the rest of us. Here's my plate which included some great slaw that Bev whipped up after she got home from shopping. I eat my slaw as a side rather than a topping - Bev does the opposite. Nice thing about a hotdog is the endless opportunities for variations - I may try a BBQ dog next time. Everything turned out great and the fries were perfect - I know they were good as Alex ate all of hers and said they were almost as good as McDonalds. While not as cold as it’s been, Sunday was still a cold, rainy, dreary day – sounds like a perfect tomato soup and grilled cheese sandwich day. It was my day to cook and I used a recipe from Michael Chiarello of the Food Network because I liked the idea of roasting the tomatoes. I doubled the recipe and used a quart of our home canned tomatoes and we had no fresh basil but did have some homemade pesto frozen as ice cubes – so I used one of them (moved out of my follow-the-recipe comfort zone). Here are the drained and chopped-up-a-little-more tomatoes before the oven. The juice on the pan was about to burn, so I removed them from the oven before they were caramelized. We squeeze most of the juice from our tomatoes when we can them, as seen in photo - not much, so I added some additional juice to the soup. It’s always fun to write about meals that exceed your expectations, but every now and then they fall short as did this one. I liked the soup, but Bev was wanting one that looked and tasted like a classic tomato soup. The carrots gave this one more of a squash color and the large amount of olive oil was very evident, so it tasted more like and olive basil with tomatoes in it soup. Here it is in the pot after being treated by the immersion blender. My bowl full - definately does not look like tomato soup. As I said, I liked it, but enjoyed it for what it was. For the sandwiches, we like tomatoes and a little onion on ours, so since I had the oven on, I decided to pre-roast them with a little oregano sprinkled on top. I just sliced the tomato, spread a little chopped onion on top and lightly sprinkled with dried oregano. I used Cabot sharp cheddar and smoked provolone for the cheese. Sandwich assembly was homemade bread, mayo, cheese one, tomato/onion, cheese two, mayo, bread. We then brushed the bread with melted butter and grilled them over medium heat until golden brown and the cheese was melted then served with sliced Clausen dill pickle – which I added to my sandwich. Here’s a shot of mine. Before I get into the stir fry, I have a request. When I was a kid, various family members would make chow mein and serve it over the crunchy, canned noodles - I liked to eat the noodles plain. I haven't had it in years and am looking for a good chicken or pork chow mein recipe - I have a couple from a basic web search. If you have one you like or can send me in the right direction I'd appreciate it. Now on to the stir fry. We had a chicken breast left from the chicken finger meal, some shrimp we’d thawed but hadn’t cooked yet, lots of steak in the freezer from the two rib eyes we’d bought on sale, and several vegetables in the frig - in our mind this means stir fry. This was a joint effort with Bev prepping the veggies and me prepping the meat and cooking. I cooked on the gas grill side burner to reduce the mess in the freshly cleaned kitchen. These are the veggies, ginger and garlic ready to go. The meat ready to go - the shrimps were marinated in some teriyaki sauce. Stir fry and egg scrambles are the two meals I can think of that I'm ok to proceed without a recipe. In addition to the meat and vegetables, we added some garlic, some ginger, some cornstarch dissolved in some chicken broth, some soy sauce and some rice wine vinegar (maybe a little too much this time), some salt and some pepper - note the word some, that's big for me. I don't have a table on the deck so I have items sitting around everywhere. First up was the beef and chicken, cooked until almost done. Removed them and added the onions, garlic, and ginger. Then the remainder of the veggies and liquids. Quickly followed by the meats and shrimp. The final dish headed for the table. Bev had cooked some white rice with carrots, peas, and garlic. Here's my dish - sorry it's a little blurry. I thought it turned out real well and with the addition of a little srichacha, mine was excellent. No way I could replicate this meal, but the nice thing about stir fry is you use a wide variety of ingredients, have it be different everytime and it's still delicious.